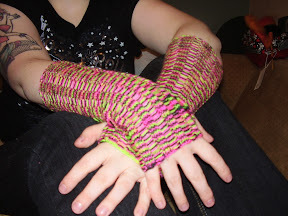 i've decided that i really need to push myself forward with my ideas of designing knitting patterns. the vogue knitting and interweave knits winter issues were disappointments to me, and today was the release of the new knitty - most people are really excited about it, but there's not a single pattern i'd knit. and for KNITTY to not have a single pattern i like is insane. here are photos of the three pairs of my you snag! glovelettes i've been working on. coming soon are the you snag! sweater (already in the knitting stage), check you out! glovelettes (one of the pair is finished and the pattern is finalized) and a few other things. i guess i've got the designing bug, though i'm starting small. here's the pattern link again. with thanks and <3 to momma-monkey. the first is pixie dust from copperpot woolies, the second is hibiscus from spunky eclectic. i have two others that i've finished but i haven't had time to photo them. they'll be up soon! i'm thinking voodoo wrist warmers for the purple, and mittens for the orange. my computer is giving me issues, so i can't really post pictures right now. however, i really want you all to be able to see what i worked on last weekend... my first-ever pattern! it's called you snag! and it's for a pair of top-down punk glovelettes with dropped stitches. 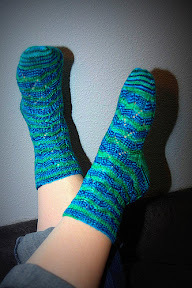 i've made two pairs already and i'm starting on a third... they're so comfy, and easy too. definitely a beginner level. pattern is here for downloading! i'm already working on a sweater based on the same stitch pattern. i really like it, what can i say? i just wanted everyone to know that my test results came back in my favour. there are certainly some medical issues i have to deal with, in regards to the lumps and sores on my breasts, but they're not cancer. right now, that's MORE than good enough for me. yes, i still haven't caught up on posting or blogstalking or anything, but i'm working toward it. life itself is a little bit crazy right now. my boss at the radio station quit, so i'm doing her job and mine both, plus working on air hours, plus rehearsing two nights a week with my jazz group, and then still trying to get up to date in yarn oddity orders and stuff for the store. 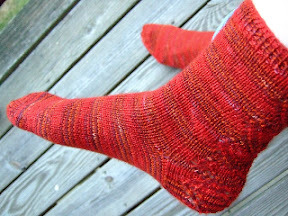 also working on that GINORMOUS order for robyn's november sock club at robyn's nest, which is going to be so awesome. anyway, things were thrown for a loop this week as i had to go in to the doctor to have a core cut out of a lump in my left breast, so that they could send it away for biopsy. and now i'm just... on edge, is really the only way to describe it. apparently it could take over a month for results. so until then, i'm going to work a lot to take my mind off of things, spoil myself in little ways to keep myself happy, and just generally try not to wonder whether i have cancer. so, due to a flurry of keep-myself-busy creativity this week, you will soon be seeing new colourways... more of 'bad brains' and 'spooky girlfriend', and the appearance of 'moods for moderns', 'this sad burlesque', and 'the elements within her'. i'm really excited about all of them. if you have a request for a yarn oddity for yourself, this week would be a great time to do it. take care of yourselves, my lovelies, and more from me soon. i <3 socks, and my favourite patterns are all momma-monkey's. 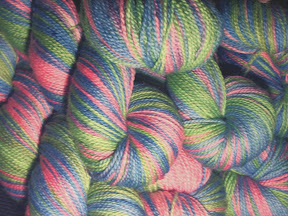 in the shop right now: two skeins of rebel, rebel and three pick-your-own-colour custom skeins, so check it out. 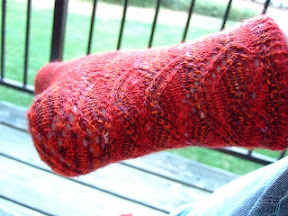 up next, actual KNITTING content, oh my! that's all i've got for this time, but trust me, there's more! plus this is a dyeing weekend. who writes this crap, anyway? ms. pixie riot (pixie for short!) is a 24 year old musician, knitter, and nerd who lives happily with her rockstar OH, a pet fish, and more acrylic yarn than most people would EVER want to see. she has pink hair, lots of purposely-inflicted holes, and some beautiful skin art. have a couple of fun buttons! I've moved up a notch! the pixieriot/pixiepunk.net pixie graphic/logo was created by the lovely, enigmatic victoria of wild thing creations, and belongs to me. seriously. i had it tattooed on my freakin' arm. all other images/creations/photos on this site are taken/created by the pixie herself, and belong exclusively to pixieriot/pixiepunk.net.